Blush is one of the most underrated makeup products out there! One of the best ways to add life to your look is the addition of a rosey blush shade to the apples of your cheeks. The problem is, when people don’t know how to properly apply blush, they can end up looking more like a doll rather than mastering a subtle, glowing flush. Not to worry! We’re showing you how to apply blush for different face shapes in this post. From where to apply blush to how to wear blush for different skin undertones, check out our best blush tips for every face shape! 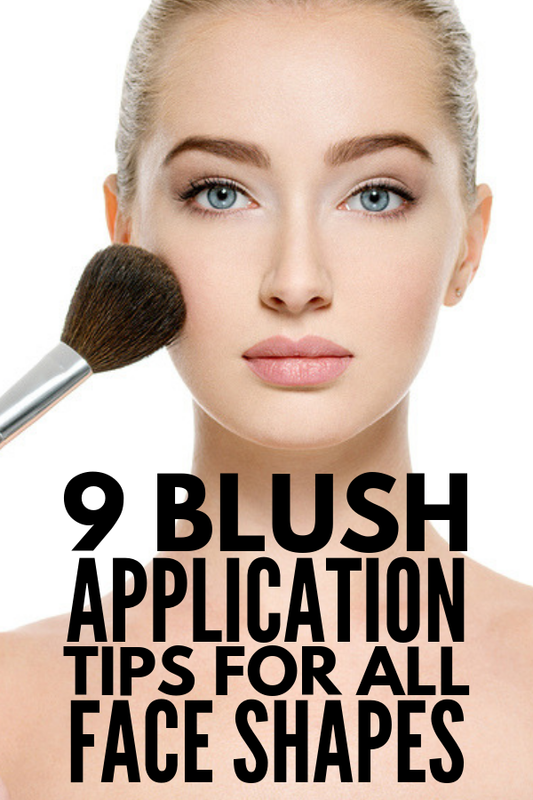 If you want blush to work for you, it’s important to know the key steps of blush application. Here are some tips to get you started! Blush looks best over an already perfectly primed face. Apply your foundation, powder and/or tinted moisturizer to set a flawless foundation for your blush. Not all blush shades will work for everyone. Choose your perfect blush colour based on your skin undertones. For gold or yellow undertones, opt for pink orange or reddish pinks to enhance brightness. For pink or red undertones, stick with light pinks to compliment your colouring, or peach to cut out redness. For plum or blue undertones, choose vivid oranges or pinks to pop against your skin! For a perfect and natural blush look, make sure to use a dense makeup brush to help concentrate the colour where you want it to stay. A small dome-shaped brush will work best if you’re applying blush to the apples of your cheeks, while an angled brush will help you achieve the chiseled cheekbone look if that’s the look you’re going for. If you have dry skin or fine lines and wrinkles, it’s best to use a cream or liquid blush. If you have oily skin, stick to powder blush. Powder blush is also better for warmer months, while cream blush is best for cold weather! If you have a round face, you may want to slim it out and make it look more angular. You can do this with blush! For a round face, apply blush in an angular motion, blending from the apples of your cheeks toward your temples. Make sure not to blend towards your nose, as this will make your face look rounder. The goal is to emphasize your bone structure as much as possible. Square faces often have straight sides and a stronger, flat jawline. To soften the angles of your face you can incorporate square face makeup, including blush! Sweep your go-to blush shade across your cheekbones onto the higher side, moving upward with long, very light motions. You want to hit all of the cheekbone, from the edge of the brow to the hairline to perfect the look! If you have an oval-shaped face, you’re in the perfect position to frame your gorgeous eyes with the accompaniment of blush. Since oval faces have prominent cheeks and an oval chin, start applying blush at the most prominent part of your cheekbone. Stroke it down towards the earlobe and blend up towards the temple. You can also add a tiny bit of blush above the temple for an extra radiant glow. A diamond-shaped face is wide at the cheekbone and more narrow at the jawline, with an arrow-like chin. With a diamond-shaped face you want to draw attention to the bottom half of your face, but never apply blush in the hollows underneath your cheekbones. Apply it to the top of your cheekbones, blending towards your ears. This will draw the eye down and highlight your cheekbones at the same time! Heart-shaped face makeup can be tricky, but it doesn’t have to be! If you have a heart-shaped face, you have a longer face with prominent cheekbones and a narrow chin. For a heart-shaped face, apply blush along the bottoms of your cheekbones, in a “C” shape going from the top of your temple downwards. You’re pretty much mimicking the way you would contour. This will help balance your strong jawline by bringing more attention to your cheekbones. If you’re in the market for a quality powder blush, this is a great option! Richly pigmented for long-lasting stay, you’ll get a healthy, radiant glow with this amazing blush! We love the idea of a blush stick! With this amazing product, you can build coverage to give your cheeks a rosy glow or a dramatic pop of colour, depending on the occasion. With easy application and a long-wearing formula, it will stay in place all day (or night)! One of the most affordable blushes on the market, Maybelline’s Fit Me blush offers a creamy and smooth texture for flawless blending. Available in an array of shades to compliment any skin tone, you’re sure to find a colour that’s perfect for you! Not just a blush, this amazing product also instantly erases lines and wrinkles so you’re left with younger looking skin! Formulated with Blur Technology, it glides on soft for a flawless, radiant finish! As we mentioned above, it’s key to have a dense makeup brush to apply your blush, but sometimes you’ll need a round head while other times you may need an angled brush. This brush set comes with 8 pieces so you can do everything from apply blush and bronzer to make your eyes pop! Blush is one of the best ways to add a touch of colour to your look! Use these tips and products to get a gorgeous look with blush! If you loved this post on how to properly apply blush, make sure to share it on Pinterest! And if you want more makeup tips and tricks, follow our Beauty Board on Pinterest!